Is Your Small Dog at Risk for Progressive Retinal Atrophy? Progressive Retinal Atrophy has been identified as having occurred in the Tibetan Terrier among other small dog breeds. Progressive Retinal Atrophy (PRA) occurs in many dog breeds and is a non-painful genetic disease of the retina in the eye that leads to blindness. PRA is not one disease, but a group of them that include dysplastic (abnormal development), dystrophic (loss of cells) or degenerative disease (deterioration) of the retinal cells. Notice Where the Retina of the Eye is located at the back of the eye structure. Before we can understand how all this happens, we need to do a mini review of the retina’s function. The retina is located at the back of the eye where it receives light coming through. Before the digital age, experts described the retina as the film in the camera. A chemical reaction occurs there that causes a nerve impulse. That impulse passes through to the optic nerve where it goes to the brain. Vision takes place in the brain. 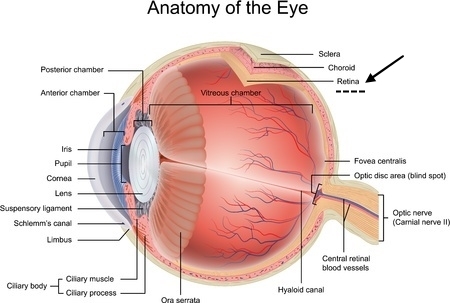 As you can see, the eye is just an organ that collects light and focuses the light rays onto the retina. Without the work of the retina, light cannot be converted to real vision. The retina contains two types of cells, the rods, and the cones. Rods are involved in the black and white or night vision. Cones are involved in day vision or color. Progressive Retinal Atrophy affects either the rods alone or both together. As the rods begin to die, the dog’s vision diminishes first in dim light (aka night blindness or poor vision in the dark). As the disease progresses, cones die off resulting in all the areas becoming affected until the dog is blind. In PRA, the cells are programmed to die because it is an inherited disorder. For most dog breeds and mixes, the mode of transmission from parent to a child requires recessive genes. Most forms of PRA involve an autosomal recessive trait. As mentioned above, PRA is not one single disease but includes many each of which affects the retina in different ways and is inherited in dissimilar ways. The most common type is Generalized Progressive Retinal Atrophy and it causes atrophy or death to all rods and cones. Generalized PRA can be dysplastic where the rods and cones develop in an abnormal way. In the degenerative form of Generalized PRA, the rods and cones develop normally but then change and die. 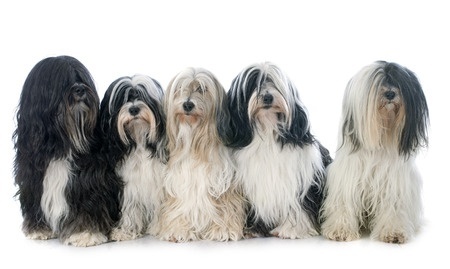 Generalized PRA can affect breeds such as the Akita, the miniature long haired Dachshund, Papillon, Tibetan Spaniel, Tibetan Terrier and Samoyed. Another form of PRA, Rod Cone Dysplasia is caused by a defect in the gene for cGMP- phosphodiesterase. It is considered an early onset type and has been identified in Irish Setter, Collie, Sloughi and Cardigan Welsh Corgi. The average age of onset and how fast the disease progresses varies from one breed to the next. The median age of onset is about six to eight years. This type of progressive retinal atrophy involves rods and cones that initially develop normally but then the rods degenerate followed by the cone cells. This is a disease with normal rod and cone cell development but late onset degeneration of the rod cells that progresses to the cone cells. It is inherited as an autosomal recessive trait and there is a DNA test for this type of PRA available for some breeds. Breeds affected include the English and American Cocker Spaniel, Chinese Crested, Labrador Retriever, Portuguese Water Dog, Chesapeake Bay Retriever, Australian Cattle Dog, American Eskimo Dog, Entlebucher Mountain Dog, Finnish Lapphund, Golden Retriever, Lapponian Herder, Miniature and Toy Poodle, Swedish Lapphund, and the Nova Scotia Duck Tolling Retriever. This PRA is caused by abnormal development of both the rods and cones cells resulting in night blindness initially and the progressing onto blindness during the day. Breeds affected include the Miniature Schnauzer and Belgian Shepherd Dog. In the latter, puppies can be blinded by the age of 8 weeks. It is not uncommon to have cataracts form as the retina degenerates. This may be the first signs of the disease observed by the dog’s owner. Unfortunately, once cataracts have developed, it is more difficult for the veterinarian to visualize the retina and diagnose progressive retinal atrophy. In the early stages, people may not be aware of the problem. The progression can be akin to the dimming switch. As the lights are slowly dimmed in the room, your eyes adjust and may not notice it until total darkness occurs. Think about the experience in a movie theater. Dogs rely more on other senses such as smell and hearing and may use those even more so as their vision dims. Most dogs that are diagnosed with Progressive Retinal Atrophy have been afflicted for quite awhile. Sometimes they are diagnosed during their yearly check up. A general vet may notice some changes in the eye while observing with an ophthalmoscope. They will then make a referral to a veterinary ophthalmologist. The only way to diagnose PRA is through eye exams done by a veterinarian. Your general vet will likely refer you to a specialized veterinary ophthalmologist. The eye specialist will use an electroretinogram (ERG) to measure the retina’s ability to respond to light. The exam involves placing an electrode on the dog’s cornea and two electrodes are placed under the skin around the eye. The ERG is similar to an electrocardiogram because they both measure electrical impulses. Just as the ECG creates a characteristic wave pattern as it measures the heart, the ERG creates a pattern that can even diagnose dogs before they have full-blown clinical signs. Some dogs may need full anesthesia while others just need sedation. There is a little risk to the procedure including an infection or corneal ulceration. PRA affects both eyes and will eventually end in blindness. There is no way to reverse or treat the degeneration that causes blindness. While there is no cure, there are now tests that can be performed on breeding animals that will help breeders make informed decisions on which dogs to mate to help prevent PRA from being transferred to the offspring. The only way to avoid the problems lies in the hands of breeders. Dogs that are intended for breeding can be examined by a veterinary ophthalmologist and the results sent to the Orthopedic Foundation of America (OFA) formally the Canine Eye Registry Foundation (CERF). Eye exams can be done once a year and dogs that are found to have PRA should not be bred. Unfortunately, in some breeds, the age of onset of PRA is six to eight years of age. Many breeding dogs are either being retired or have already been retired by this age, so they very well may have passed on the disease to their offspring before the onset of the disease in themselves. A rcd4 mutation that causes late onset (10 years old and older) has been identified in Setters (Gordon, Irish, and English), Australian Cattle Dogs, Polish Lowland Sheepdogs, Small Munsterlanders, and Tibetan Terriers. Tests results will show whether the dog is clear, a carrier, or is affected. Another type of PRA, prcdPRA (prcd” stands for “progressive rod-cone degeneration) has a genetic test offered by Optigen. Breeds where this test is available include: American Eskimo, Australian Stumpy Tail Cattle Dog, Australian Cattle Dog, Chinese Crested, Entlebucher Mountain Dog, Finnish Lapphund, Golden Retriever, Lapponian Herder, Miniature and Toy Poodle, Nova Scotia Duck Tolling Retriever, Swedish Lapphund. While blindness may seem very scary to people, dogs adjust very well to their gradual loss of vision. There is no pain, and they begin to use their other senses to get the same information that they used to when they had sight. As long as their environment remains unchanged, they get along fine. As owners, we want the best for our pets. There have been many advancements in genetic research, and one would expect this trend to continue. While there is no cure for Progressive Retinal Atrophy at this time, there is hope that eventually the problem will resolve itself through excellent breeding practices. At the same time, PRA is not life threatening, and many blind dogs live long happy lives.